Are you considering Christmas gifts from Shop Pony Club? Get your orders done early to guarantee getting your fabulous items before Christmas. Deadlines this year are early. Dec. 15 is the last day to order all other items to receive in time for Christmas! Our Quick Facts tab provides users easy access to basic program data, history, and videos that are related with our program. Do You Sometimes Forget to Eat? Did You Remember to Order your Banquet Ticket at Convention to Hear about Rosie Napravnik's Career? Tickets for the Saturday night Banquet are selling fast! 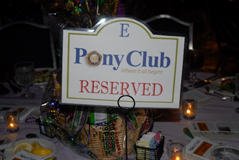 Don't miss this incredible opportunity to hear famed Thoroughbred Jockey Rosie Napravnik, enjoy a lovely dinner and then dance the night away with all your newest and oldest Pony Club friends and family. Banquet tickets are only available by pre-purchasing them before noon Eastern Time on Jan. 4. Make sure to get yours before it is too late! Pre-registration and Saturday night banquet tickets are available by visiting the Registration page of the Symposium and Convention website. Interested in learning more about the Convention? Watch this webinar that will give you an overview of what to expect! Questions? Contact Erin Woodall, Activities and Events Director. Don't miss your opportunity to represent The United States Pony Club in 2018, and host Pony Club members from around the world. This exchange includes competitors from the U.S., Great Britain, Ireland and Australia. The adventure begins July 13, and will travel around the Tryon, North Carolina, area of the U.S. Applications for Team Members, Coach and Team Manager are due by Jan. 15. For more information and to apply, please visit the 2018 International Tetrathlon Exchange Page. Horses love Redmond Rock on a Rope! Ideal for hanging in the barn, stall or fence post. Your horses will get essential trace minerals and electrolytes in a natural blend only nature could have made. 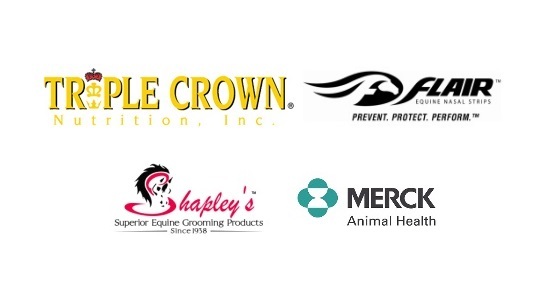 For more information visit www.redmondequine.com. One of the added benefits to the Pony Club website is YOUR ability to list local and regional events on the National Calendar. We encourage everyone to submit your events for addition to the calendar. To submit an event, start by logging into the website, visit the Calendar page, and on the right hand side, you will see "Submit an Event." There will be some fields for you to complete with the pertinent information. We encourage everyone to include their Regional, and local Pony Club events on the calendar to encourage cross participation as applicable. In-depth lessons, created to help at the club/center level and focus on the Standards of Proficiency levels D-1 through the D-3 level. There are lessons covering both unmounted Horse Management and mounted lessons. Horse Management Lessons Plans are sorted by topics. Mounted Lesson Plans are sorted by skills required. Time is running out to adopt a horse for the New Vocations Pony Club Challenge. Interested Pony Club members have until Jan. 31 to adopt a Challenge-approved horse and only 25 spaces remain for the 2018 competition! 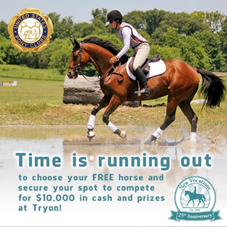 Approved applicants receive a free horse, an $1,800 stipend and the ability to compete against other Challenge members for $10,000 in cash and prizes at Pony Club Championships East in 2018 in Tryon, North Carolina. For more information or to apply, please click here.